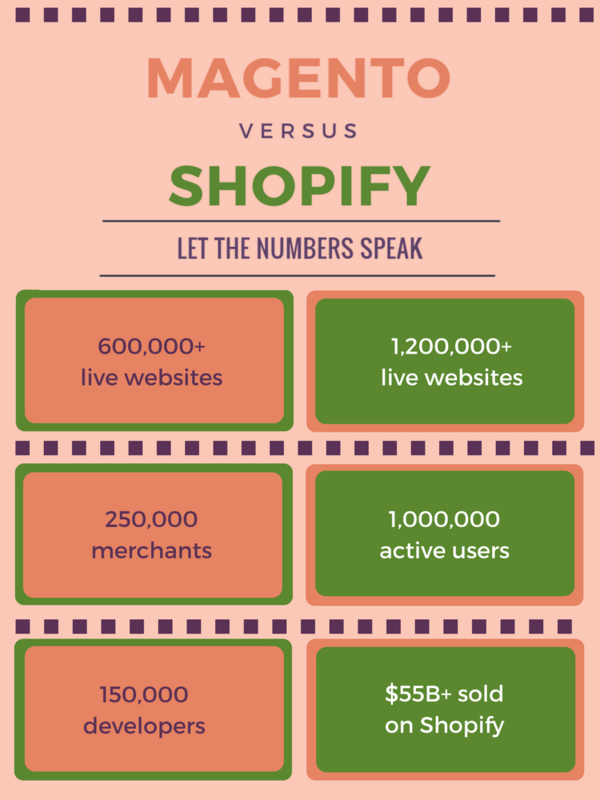 Magento vs Shopify - which one would work for your business? Seems the impossible decision to make? You’re not alone here. Majority of online retailers are confused between these two eCommerce giants that are pitted against each other very often. While, in fact, Magento and Shopify are very much different and will meet diverse, even not opposite, requirements. Keep reading and find out what are the critical aspects you have to consider before committing yourself to any of the two platforms. Magento is open-source eCommerce solution that offers vast customization opportunities. Being the most flexible platform, it comes with the professional look and smartly-organized categories. Main advantage - Magento allows editing and contributing to its code and gives precious opportunity to add any functionality you find inevitable. The list of Magento eCommerce features is extensive. The cart will become an excellent helper for medium and large companies. Shopify is hosted shopping cart, designed exclusively for selling online and has all the functionality modern eCommerce cannot live without. Shopify is an icon to the other shopping carts currently available on the market. It frees business owners of any additional headaches like looking for high-quality hosting or taking care of the security issues. Because Shopify is a hosted solution, you can concentrate on important things. 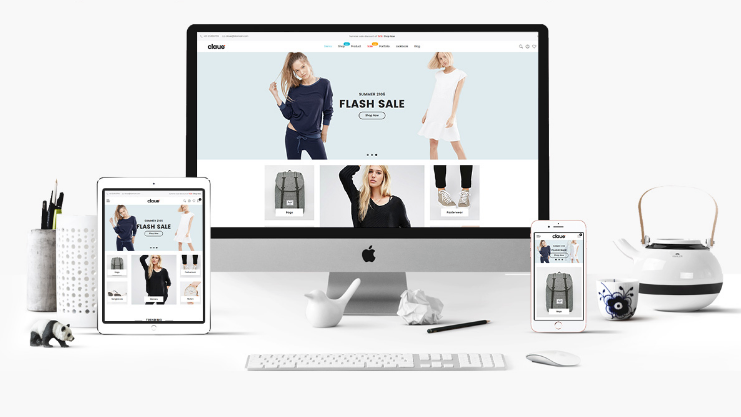 Pros: it is easy to use, launching and managing online shop requires no tech competence; Shopify templates are responsive by default and look great on any device your customer might choose. Both solutions are very popular but let’s focus on the characteristics that constitute Magento and Shopify difference. The first and most significant fact you have to keep in mind - Shopify is a hosted platform and Magento is a self-hosted solution. What does it mean? Shopify takes care of all the hosting issues and the plan you’d select already includes these costs and there are no extra spendings to worry about. Hard to imagine? Assume you are buying an all-inclusive vacation package. You pay a particular sum of money and that’s how much your holiday is going to cost. With Shopify, at once you have the clear understanding how much money maintaining e-store will require. One more significant bonus - no need to worry about the updates. This aspect is taken care of while building a store on a hosted platform. Magento is open-source platform and you’ll have to deal with all the hosting issues yourself. Finding an efficient hosting provider for your needs might turn into a daunting task as many factors should be kept in mind. It is virtually not something impossible, yet this aspect requires attention. There are a variety of hostings recommended by Magento itself, and you can be sure the service will be of supreme quality. Magento offers cloud hosting as well. There are two plans to choose (we’ll discuss the prices below). Both Shopify and Magento offer elegant and user-friendly designs. Shopify Themes contain ten free templates and 53 paid ones that can be filtered according to the number of products your store will have. The price may vary from $140 to $180 per theme. 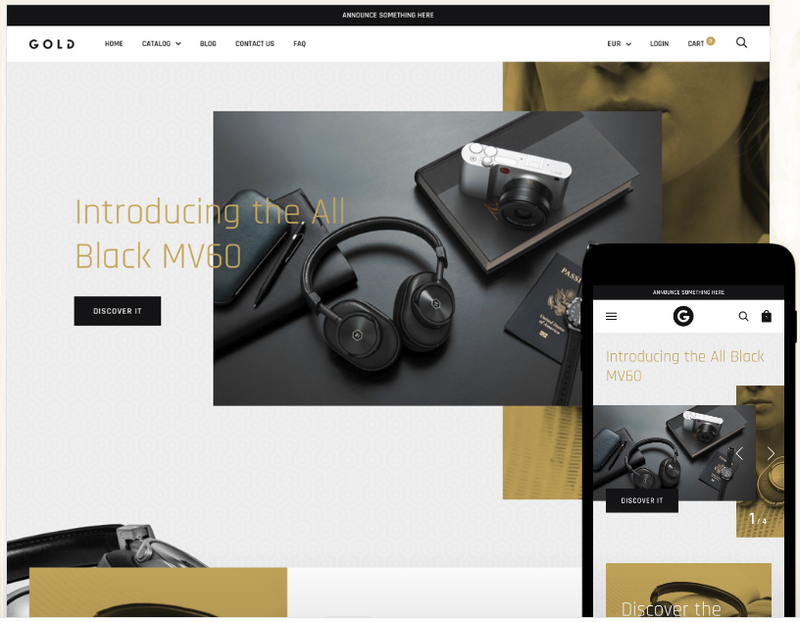 All Shopify themes are responsive, and the platform offers free, built-in mobile commerce functionality. The templates look great by default that is why there is no need to modify them a lot. Themes for Magento offer one free template and 12 paid ones (the price starts at 29,95 and may reach even $499). All of them come with the efficient and trendy look and well-organized categories. The small amount, you’d say. That’s no problem at all - there is a bunch of designs compatible with Magento offered by ThemeForest. At this point, Magento will provide you with more variants of design to choose. If to take into account that the code is open - you are free to add or change anything within a particular template. As for the responsiveness - this is the feature to look in the template if you want the website look great on any gadget currently available. With Shopify, you get drag-and-drop website builder enabling you to customize the e-shop by moving the elements around the page exactly the way you want. Its interface is user-friendly. Having no programming skills? In this case, launching and managing Magento e-store will require some learning if you are not ready to hire a developer to perform the necessary code manipulations. The eCommerce solution gives you complete freedom, there are absolutely no restrictions. But there always has to be a fly in the ointment! Seek freedom? Possess the skills to handle it. Here is a nice metaphor to explain the difference between the two. With Magento you can build a house from scratch. Set the foundation and do all the repairs. Once Shopify is your choice - you move into a house built in advance. Paint the walls, buy the furniture and devices to make the life comfortable. You have the structure and work to personalize it the way you want. Isn’t it more distinct this way? Time is money, and you know that. With Shopify, you can start selling immediately. Choose a template, make it look the way you want, add products with descriptions and your store is ready to go live. With Magento, dealing with hosting arrangements might take some time. Once you have good hosting provider, the issue becomes less crucial. A couple of days is what you’ll pay for the unlimited customization capabilities Magento will give you. Both Magento and Shopify have their issues regarding the costs each of them will require. Let’s start with Shopify. Launching the e-store will involve some initial one-time spendings. First of all, choose a theme and if you want the storefront to look great - choose a paid one. The fees vary from $140-180 per a template. Secondly, this eCommerce solution will give your store a domain name, for example, lionred.myshopify.com. To sound more professional, you’d want to buy a domain lionred.com, and that will take up to $15. Domain name is the aspect to be taken care of regardless of what shopping cart you’re using. You can buy domain name via Shopify yet modern online retailers always have to think in long perspective. Assume you want to migrate to another eCommerce solution - taking your domain with you will be a challenge in this case. To continue, Shopify offers 3 monthly plans. Each of them includes selling the unlimited number of products, limitless file storage, 24/7 support, and fraud analysis tool. Transaction fees are the key thing to consider here. The percentage decreases with each more advanced plan. 2% in “Basic”, 1% in “Shopify”, and 0,5% in “Advanced”. Shopify’s significant advantage regarding transaction fees is that the platform has its own payment processor using which you’ll be able to save on transactions considerably. Note that paying Shopify monthly fee you deal with all the bandwidth and security issues of your online store. This way, you can concentrate on improving customer experience and optimizing the client's journey. Magento is free itself. Nevertheless, once it is the dream platform you’ll also have to pay for the theme you choose (from $29 up to $499 for the template) and domain name ($10-15) for the website. Furthermore, you’ll need to find hosting and bandwidth plan that will suit the online store requirements. At this stage, keep scalability in mind. The business will grow, and the number of purchases and visitors will increase. The plan should give the store enough power to handle the flow of customers you have and might receive in future. Magento doesn’t have its own payment processor, and you’ll pay the transaction fees for the one you’ll choose to use. There are also 2 Magento Pricing plans that include cloud hosting. If the fees seem quite high keep in mind that Magento offers the functionality and enables you to create a real eCommerce giant. Both solutions provide Free Demos for you to get an idea how Shopify or Magento work. Only, Shopify has 14-days trial, while Magento offers demo for 30 days. At Cart2Cart we deal with 80+ eCommerce solutions daily and know the trends of the market. 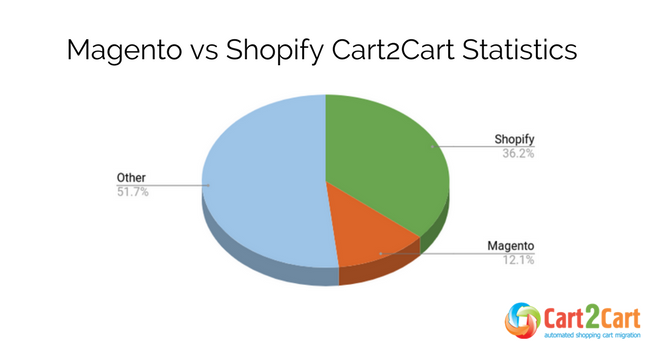 According to all the shopping carts migrations performed in 2017 by Cart2Cart, Magento and Shopify are the two TOP platforms to which merchants were moving, and together they make almost the half of all the transfers. The percentage of data migration to Magento constitutes 12,1% of all the switches performed during the previous year. Shopify is the true leader according to the data import performed - 36,2% of migrations are the data import to this eCommerce solution. Click here to explore the slightest peculiarities of Shopify import. Or check how Magento import can benefit your business. 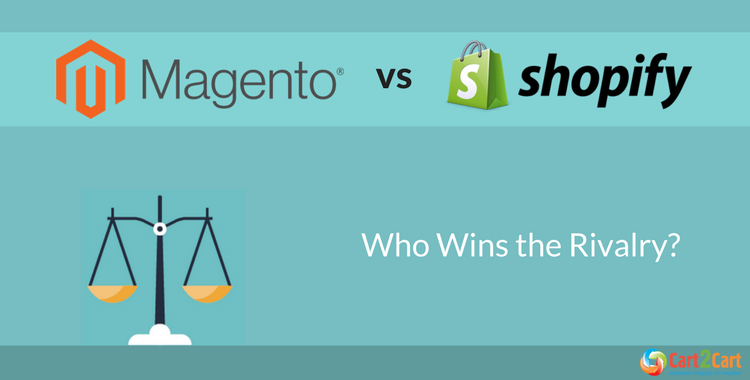 Magento vs Shopify is the opposition you might find on each eCommerce blog. Nevertheless, focusing on their advantages authors very often forget to define their major difference. We’ve outlined the key 5 differences you should keep in mind while making a decision which one will become your destination. Clearly, both Magento and Shopify are advanced shopping carts with robust eCommerce functionality, great SEO capabilities and variety of top-notch features. The nature of the two carts forms the basis of their difference. Because Shopify is hosted platform and fully managed service it will release you from all the hosting, bandwidth and security issues. Plus it provides greater ease of use. Magento requires you to purchase hosting and deal with all the software setup. You have to be tech-savvy to cope with all that successfully. Free trials each solution offers might be a good idea to explore Magento and Shopify in action and make the final leap. If you know which shopping cart is your choice, release yourself from all the eCommerce data migration hassle and import all the entities smoothly with Cart2Cart. Regardless, which Target Cart you choose we make the transfer easy. Sign up for Free Demo to check how it all will work for you!